This detached chalet style house is situated in Huntingfield Road and is ideally located for Meopham Parade and Meopham Primary School. It is also approximately 15 minutes walk to Meopham mainline railway station and further amenities within the village. 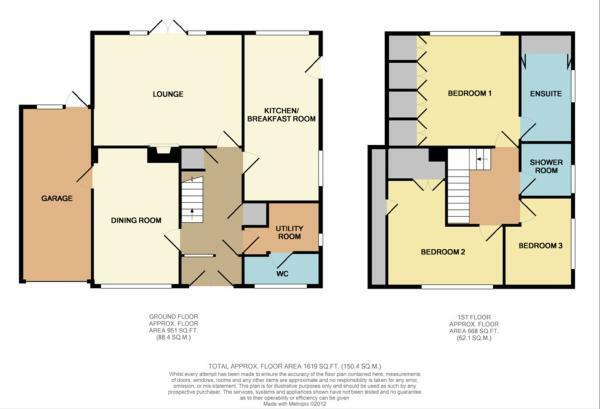 The property would make an ideal family home and it offers versatile accommodation with a ground floor shower room and a family shower room and an ensuite bathroom to the first floor. There is also a dining room which can be used as a fouth bedroom. The property needs to be viewed to be fully appreciated as there is a south facing rear garden and there is further scope to extend subject to the usual planning permissions. ENTRANCE PORCH: Access to entrance hall. ENTRANCE HALL: Stairs to first floor. Understairs cupboard and storage cupboard housing alarm and water softener. Wood flooring. Access to dining room/bedroom four, lounge, kitchen/breakfast room and utility room. KITCHEN/BREAKFAST ROOM: 19'5 x 8'10. Bespoke maple wood wall and floor units with sink unit and mixer tap with inset drainer, double eye level oven, gas hob and extractor fan over and integrated microwave. Space for fridge freezer and space for dishwasher. Space for drinks fridge. Tiled flooring and part tiled walls. Downlighters. Double aspect. Door to rear garden. LOUNGE: 17'5 x 12'11. Gas coal effect fire with surround. Double doors to rear garden. DINING ROOM/BEDROOM 4: 16'4 x 9'10. Wood flooring. Door to garage. UTILITY ROOM: 8'9 narrowing to 6'1 x 5''5 narrowing to 2'1. Wall and floor units with single drainer stainless steel sink unit and mixer tap. Tiled splashback. Space for washing machine, tumble dryer and fridge. Tiled flooring. Door to shower room. SHOWER ROOM: White suite comprising of low level WC, wash hand basin with mixer tap and small panelled bath with mixer tap and shower over. Tiled flooring and tiled walls. Downlighters. FIRST FLOOR LANDING: Loft hatch with access to partly boarded loft. MASTER BEDROOM: 12'11 x 11'4 to built in wardrobes. A selection of built in wardrobe cupboards along one wall with matching bedside tables and dressing table with a built in chest of drawers. Door to ensuite bathroom. ENSUITE BATHROOM: White suite comprising of low level WC, wash hand basin with mixer tap and storage above and under. Panelled bath with shower over and mixer tap. Built in cupboards along one wall housing hot water cylinder. Fully tiled walls. Downlighters. BEDROOM 2: 'L' shaped 13'9 narrowing to 6'2 x 12'6 narrowing to 7'2. Storage into eaves and walk in wardrobe cupboard. BEDROOM 3: 10'4 x 7'11 max. FAMILY SHOWER ROOM: White suite comprising of low level w.c, wash hand basin with storage under and above and fully tiled shower cubicle. Fully tiled walls. Downlighters. GARDENS: Rear: South facing, mainly laid to lawn with two patio areas. Bushes shrubs etc, side access to front via gate. PARKING: Driveway: Block pavier driveway for several cars. Garage: 20'4 x 8'4 with electric up and over door. Power and light. Storage to loft space. Personal door to rear garden. Disclaimer - Property reference 3187. The information displayed about this property comprises a property advertisement. Rightmove.co.uk makes no warranty as to the accuracy or completeness of the advertisement or any linked or associated information, and Rightmove has no control over the content. This property advertisement does not constitute property particulars. The information is provided and maintained by Walker Croft, Meopham. Please contact the selling agent or developer directly to obtain any information which may be available under the terms of The Energy Performance of Buildings (Certificates and Inspections) (England and Wales) Regulations 2007 or the Home Report if in relation to a residential property in Scotland.